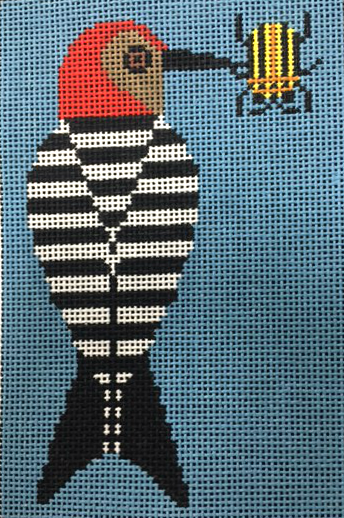 A mini size Baffling Belly Charley Harper needlepoint that makes a perfect small framed piece or ornament. The design is hand painted onto 18 mesh mono needlepoint canvas and measures 3.5" x 5.5". This Charley Harper needlepoint is sold canvas-only or as a kit. We use DMC cotton floss or Bella Lusso wool or Pepperpot silk. If you wish to purchase stretcher bars we recommend one pair of 8" and one pair of 9".